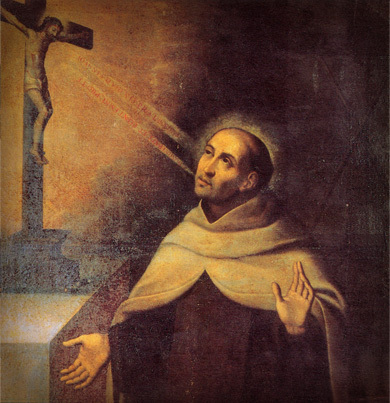 Today (well, by the time I’m publishing this I suppose it’s yesterday) was my favorite Saint’s feast day: Saint John of the Cross, Doctor of the Church and companion of St Teresa of Avila in the Discalced Carmelite reform. I have to write a few words about him, though it will be more brief than I would wish. For some reason I find those kinds of reactions hilarious. John was of course a favorite of St Teresa, clearly achingly dear and beloved to many Sisters and laity who knew him in life, and the primary spiritual influence on St Therese of Lisieux, among many others. I considered myself an atheist when I “met” Saint John of the Cross. This was in about 2001. I was a “bad” atheist not happy with atheism, deeply unwilling to let myself be deceived, but attempting to pray by being present to reality, what truly is. And what do you know, but I had an overwhelming experience of God’s profoundly personal and overflowing love for me and for all people that suddenly shed great light on the Gospels as speaking truly of this love. It changed my life in that I knew unavoidably what I most wanted was to live in a way that somehow, although I realized my own efforts were almost nothing in comparison and could not even repay a fraction, responded to that love. In trying to understand this powerful experience, I learned of Saint John of the Cross, and read his Ascent of Mount Carmel and The Dark Night of the Soul. I had never read anything quite like it, but I found it totally compelling. John was for me a profoundly credible witness to the experience of God. He clearly understood and helped me to understand the experience I had–a kind of experience of God not too infrequent for beginners. I completely trusted him, and that he was talking about something very real, something that not just subjective. St John of the Cross taught me faith, how to believe in God, when formerly I’d thought that was impossible for me. I also began to realize that when I was an atheist I had a “strawman god” that I couldn’t believe in, but in reality was not what educated Christians believed in either. With as pitiful an education as I’d had in CCD, I had not understood in any remotely adequate way what Christians actually believe about God, and that faith is very compatible with reason, and vice versa. I found that John of the Cross, too, was intensely concerned with the truth and not being deceived. His writing is entirely about love, and I understood quickly that his austerity, his “nadas” and love of the Cross that is absolutely radical and frightens and repels some readers, is simply about singleheartedness for God Who loves us. I understand his “nada” doctrine as being about truly preferring nothing over Christ. In the words of Fr Thomas Dubay it is “entirely aimed at reaching an enthralling immersion in God.” It is about purification to love God with all one’s heart, soul, mind and strength and loving, and enjoying creatures in a way rightly-ordered in light of that singleheartedness for God. Part of the intense joy in the writing of St John of the Cross is because through what seems like an absolute renunciation of the world and all good things and enjoyments, one receives all things in their true beauty and goodness in Christ. As we sing at Benediction, omne delectamentum in se habentem! Now, obviously I didn’t understand everything perfectly right away, nor do I still I’m sure, but he led me onward and made me want to keep praying and read more of the writings of the Saints and learn, he was a great friend. It was years more before I actually returned to the Sacraments, returned to the Church. I have felt all along the way that St John of the Cross was close, and praying for me, and at various times I had some remarkable assurances of that, and there is really much more to the story. When I received the Sacrament of Confirmation after my reversion to the Faith, I picked the name Juanita because I wanted John as a particular patron. When I was away from the Church I lived a very unchaste and degraded life, but it was from right out of the midst of that, even before I had quite decided to return to the Church, that through the formative influence of John of the Cross’ teachings and the joy I understood there not only could be but knew there would be through singleheartedness for God, I experienced a conversion to perfect chastity, absolutely as a positive choice for God, and an intense love relationship, which I then felt God was calling me to for life. That this was a supernatural grace, I cannot doubt, because I always felt that as a gift, and though it’s been I think 8 years, I have never been able to doubt for a moment that God called me to celibate chastity for life, but that has only come to seem more true. He’s oft misunderstood, sometimes it seems like he’s badly misunderstood more often than he’s reasonably well understood. His teachings get misused or distorted in some unfortunate ways. But this Saint’s teaching is an absolute treasure trove and there is so much there that is so sorely needed for our time, I don’t have time to begin to talk about that. Although my hardcover copy of The Collected Works of St John of the Cross is falling apart from being constantly carried around with me everywhere for years, I don’t always read it that much anymore. When I do, somehow I just open the book to anywhere and what’s on the page is immediately applicable, helpful and consoling. It is the most extraordinary thing.